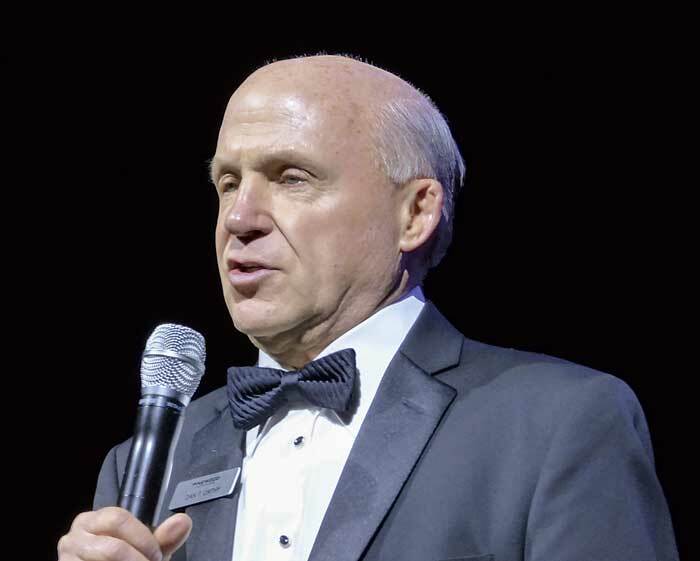 Chick-fil-A CEO Dan Cathy welcomes 750 guests to Pinewood Studios' largest soundstage for a gala in support of Fayette charities. Photo/Ben Nelms. The Reel People Care charity gala held Jan. 12 at Pinewood Atlanta Studios again this year came with a full house of guests supporting the work of nonprofit organizations across Fayette County. The annual gala has raised more than $3 million since 2014. Guests line up for the food served up by Hanna Brothers catering. Photo/Ben Nelms. Most guests entering the 40,000-square-foot Soundstage 17 stopped to have their photos taken amid lights and back screens. Lining the perimeter of the soundstage were items available at the silent auction and a number of interactive areas, such as a make-up trailer and a mock TV set, where guests could get a closer look at the world of television and movies. And of course, there was the meal from Hanna Brothers caterers. 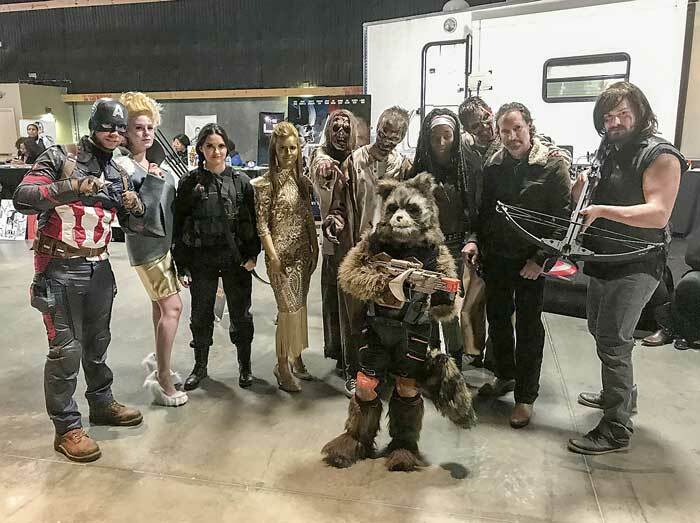 Mixing in with large crowd were characters from Marvel movies, such as the Avengers and Guardians of the Galaxy. And, yes, the setting came complete with zombies. 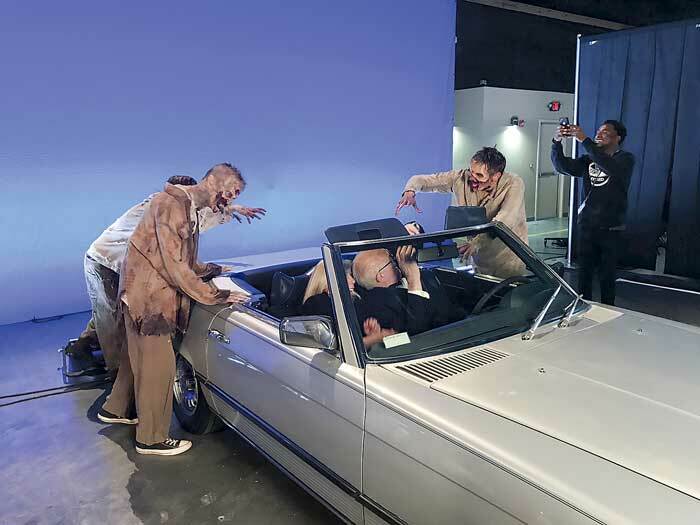 A fake zombie attack brought out the smartphone cameras Saturday night. Photo/Ben Nelms. Pinewood Atlanta Studios President Frank Patterson took the lead in addressing the audience assembled in one of Pinewood’s large soundstages. As in prior years, the venue is large enough to hold the 750 guests attending. Actor Chris Tucker took the stage to converse with Patterson, commenting on his career and growing up in DeKalb County. Chick-fil-A CEO and Pinewood Chief Visionary Dan Cathy spoke about the work performed at the studio and the emerging Pinewood Forest commercial and residential development across Veterans Parkway from the studio. Characters from films shot at Pinewood Studios gather for a family portrait. Photo/Ben Nelms. 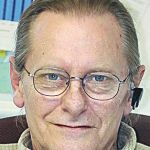 Among the speakers during the gala was Fayette Senior Services (FSS) Director of Operations Dan Gibbs, who referenced the range of services offered at FSS and explained that money raised at the gala purchases items such as handicap-accessible vans. In all, 21 area nonprofits benefitted from the Reel People Care Gala. 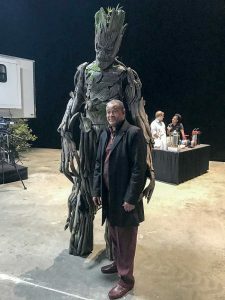 “I am Groot, but I don’t know who you are,” might be the unspoken dialogue of the “Guardians of the Galaxy” hero of few words, one of many characters at the Gala. Photo/Ben Nelms. As has become evident in Fayette County, the gala again this year was a top-notch event that displayed the mark Pinewood Atlanta Studios has made on Fayetteville and Fayette County. The annual gala has raised more than $3 million for local nonprofits since 2014. A survey around the soundstage easily showed the work that went into the production. 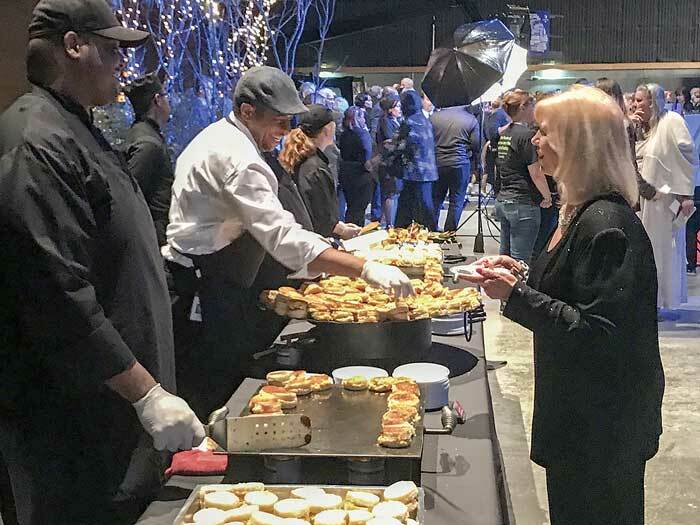 In total, 26 vendor companies located at Pinewood Atlanta helped make the gala possible, as did the 150 volunteers continuously providing their services Saturday night.